We all know that off-the-bench piano games are beneficial for children. After all, kids learn best when there are frequent changes of focus within a lesson. But if you don’t have time to leave the piano, on-the-bench activities can be just as useful… especially when you pull out a set of Iwako Erasers. Iwako erasers, often referred to as “Japenese Erasers”, are cute and inexpensive erasers shaped like food, animals, and objects. They are readily available in many different places (check out Amazon) and come in wonderfully fun, “themed” packages. But not only are they cute, they may even replace stickers as a piano teacher’s most valuable tool! If you’re new to Iwako erasers or have never used them before, we suggest you buy a couple of sets and then put them to good use with our 10 “quick and easy” Iwako Erase Piano Games below. Once you’ve loaded up on Iwako erasers (be careful, they’re addictive!) get started with these ten suggestions for on-the-bench, piano activities. Then, let your imagination take over as you find more and more ways to incorporate these fun little tools into your teaching. 1. 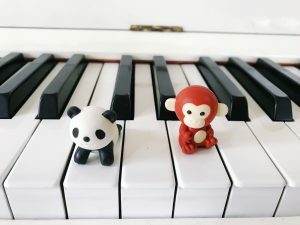 Keyboard Awareness – If you’ve selected an eraser set with animals, you can use them to reinforce your young beginners’ ability to name keys on the piano. Using the first letter of each animal’s name, have your student place the eraser on the correct key on the piano. For example, a giraffe would be placed on “G”, a frog would be placed on “F” etc. 2. Stepping and Skipping – When your primer-level book introduces stepping and skipping, grab two erasers and give them to your student. As you point to various examples of stepping or skipping in her music, have your student name the interval (a step or a skip) and then place the erasers on the piano to represent the step or skip. 3. Higher, Lower, Repeating – An early (yet important!) ear training skill is the ability to discern whether sounds are moving higher, moving lower or repeating. To reinforce this skill with erasers, place one eraser on a key and then have your student close her eyes. Beginning one key above where the eraser is resting, play three sounds stepping higher, three sounds stepping lower or three sounds repeating. Next, ask your student to open her eyes and then walk the eraser up or down the piano according to the sounds played. For example, if sounds were stepping higher she would take the eraser and walk it up the piano, making sure to “step” on each of the three keys played. 4. Key Signature Awareness – With an older student, you can use Iwako erasers to increase understanding of key signatures. To play this activity, name a key signature and then have your student place erasers on the accidentals that are found in that key. For example, if you called out, “D major”, your student would place erasers on all of the F# and C#’s on the keyboard. 5. Interval Ear Training – For ear training fun, place an eraser on any key and then have your student close his eyes. Next, play any interval, using the key where the eraser is resting as the bottom note. Instruct your student to open his eyes, name the interval that was played and then place a second eraser on the key that represents the top note of the interval. 6. Chord Inversions – To reinforce chord inversions, call out a chord name and an inversion and have your student place the erasers on the corresponding keys. For example, if you call out, “G Major, first inversion” your student would place erasers on B, D and G.
7. 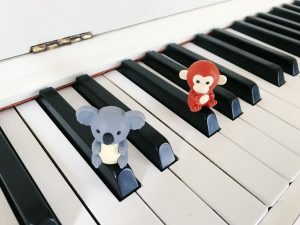 Note Reading – Using your student’s current piece, place five animal erasers on the keyboard so that each is sitting on a key that corresponds with a note in her piano piece. 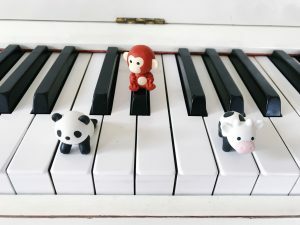 Next, ask your student to name a key where an animal eraser is resting, pick up that animal and then use it to tap every note in her piano piece that corresponds with animal’s key. Repeat this process for the remaining five erasers. 8. Major vs. Minor Chords – Place three erasers on keys that form a major or minor triad. Have your student examine the arrangement, name whether the chord is major or minor, and then play the keys to determine if he was correct. 9. Scale Practice – Pass your student a set of erasers. Next, name a scale and then have your student arrange the erasers on the keys in the correct order to represent the named scale… being sure to include the correct accidentals. 10. Grand Staff Awareness – To reinforce grand staff note reading, place three different erasers on three keys that correspond with the same note name. Have your student remove one eraser from a key and then draw its corresponding note on a blank grand staff. For example, place erasers on Bass C, Middle C and Treble C and have your student remove the eraser on Bass C and draw a note in the 2nd space in the bass clef (etc.). Have your student repeat this process with the remaining erasers. Let Your Imagination Create Piano Lesson Fun! The sky’s the limit when it comes to how you can use these erasers as piano teaching tools. 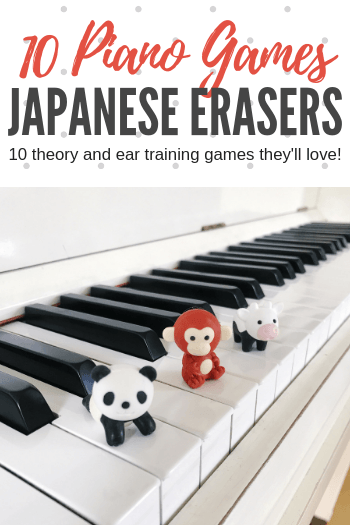 Do YOU use Iwako erasers as piano teaching tools? Share how you use them in the comments below! For more piano lesson fun, check out our WunderKeys Primer-Level method books. Packed with off-bench activities, on-bench learning, enjoyable pieces, teacher duets, ear training and even cut-and-play piano games, these books make filling a 30 minute piano lesson with beginners an absolute breeze! Find out more about this rapidly-growing method book series here.